In our first month here, I wrote about our fool’s errand to Thaba-Tseka—the Thaba Tseka car had run out of gas and we had to make the 6-hour round-trip drive to deliver a container of petrol. A few weeks ago, we were sent on a similar mission. Lesotho, pre-industrial as it sometimes seems, necessitates trekking halfway across the country to deliver paperwork. So Reid and I set off on a Friday morning to bring Thabang, the outreach worker in Thaba Tseka, a spreadsheet. I joked to Reid that now, with my second trip to the Thaba Tseka district, I would have spent a total of 5 minutes there. Still, it was a nice day, and an excuse to leave the office. The police were conducting a case that required them to interview someone in Thaba Tseka, so we gave them a ride as well. People are cooperative like that here. We drove the winding dirt roads out to St. Theresa clinic to meet Thabang. A group of women were waiting outside the clinic when we arrived, most holding babies or watching small children. I noticed one woman with a bundled child, her face smeared with the white zinc that the Basotho sometimes use to protect their skin from the sun. She must have walked a long way, I thought. We handed the form to Thabang, and then decided that he would come with us to show the police the village where they needed to go. We were climbing back into the Land Cruiser when a woman, the one I had noticed, approached the car. She exchanged a few words with Thabang, and as she did the blanket slipped slightly from the bundle she was carrying. I froze, a cold feeling coming over me—the one that goes up and down your spine when a mundane situation suddenly becomes precarious and important. Thabang turned to us, “This m’e has been waiting for me, I need to go talk with her.” He jumped out of the car. I turned to Reid, “We need to go with them. That baby was not ok.” I had caught a glimpse of a wizened little face, eyes wide and cheeks taut—not the face of a baby at all. We all trooped in to Thabang’s office, and the m’e unwrapped the bundle. We learned that his name was Tsepang. He was the most frightening thing I have ever seen. His eyes stayed wide open and observant as we gazed down at his skeletal body. 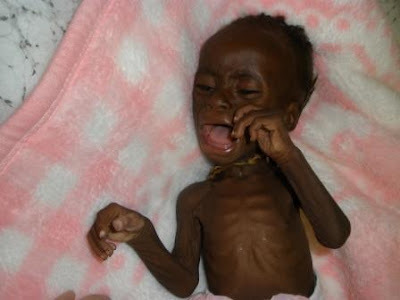 I could not (still cannot) comprehend how a seven-month old child could survive such wasting. We didn’t bother taking off all his clothes in the cold room to weigh him. It was too apparent that this was an emergency situation. With all of his clothes, he was 6.4 lbs. Tsepang on arrival at the TTL. The m’e who brought Tsepang in was a neighbor—someone who had apparently taken pity on this desperate orphan, whose mother had died a month before and whose grandmother was gravely ill. Thabang told her that we would be taking the baby to TTL in Mokhotlong, and showed her a picture of our brochure—the one that has pictures of Palesa, the TTL poster-child who came in as a skeleton and left with the nickname “Tank.” The neighbor smiled, and handed over Tsepang with obvious relief. We had made up a bottle of formula at the clinic and I fed Tsepang as we drove. He ate well, thankfully. He had been sucking on his thumbs since we had seen him, sucking with desperation, and when we pulled them out of his mouth he would scream. The thumbs were pruned, like they had just come out of the bath, and the skin had peeled away so that they were nearly white. After his first feeding, his eyes closed and the thumbs finally slipped out of his mouth. I was grateful for his rest, but spent the rest of the drive in bursts of panic, placing my pinkie under his nose to make sure he was still breathing. We emerged from the car back at TTL, and several outreach workers saw the baby. “Ache, Palesa,” they would say, comparing him with the baby everyone had previously thought of as the worst it could get. We heard this over and over, as the bo’m’e and staff discussed Tsepang in Sesotho—a mention of “Palesa.” I think in all of our minds we were reassuring ourselves that a child like this could survive. Palesa survived, and so could Tsepang. Living in Lesotho, you realize that things so often go the other way, and thus cling to examples of children surviving against the odds. Thankfully, Tsepang is confirming our hopes. 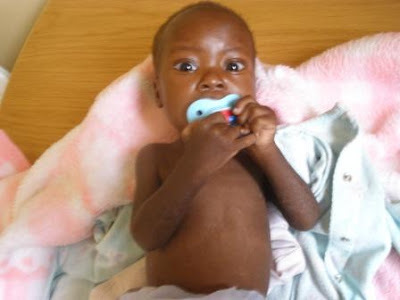 In his three weeks at TTL he has gained enough weight to be almost unrecognizable from the skeletal baby we first saw, and continues to eat well and show no other signs of ill-health. We are hoping that we can continue to update with good news of how this boy, fighter that he obviously is, progresses and grows. After just two weeks at TTL, and with a pacifier in place of his thumbs. Did you also know that terrorism affects women more than any other demographic group? What a powerful, compelling example of the incredible life-saving work that TTL does. The before and after pictures of Tsepang tell quite a story. Bridget--I can't imagine the feelings and thoughts you must have had while carrying and feeding that sweet baby on the ride back to the safe house. Wow. You don't know me but I'm friends with Megan and I was at your going-away party/"Not...Rectorpalooza". In any event, I LOVE your blog and look at it often. You are an incredibly awesome couple and an inspiration :) Stories like Tsepang's make me want to drop everything and move to Lesotho! Keep up the great work and I'll keep you in my prayers.